Water play is one of the easiest activities to set up for toddlers and it’s a perfect Spring or Summer toddler activity. 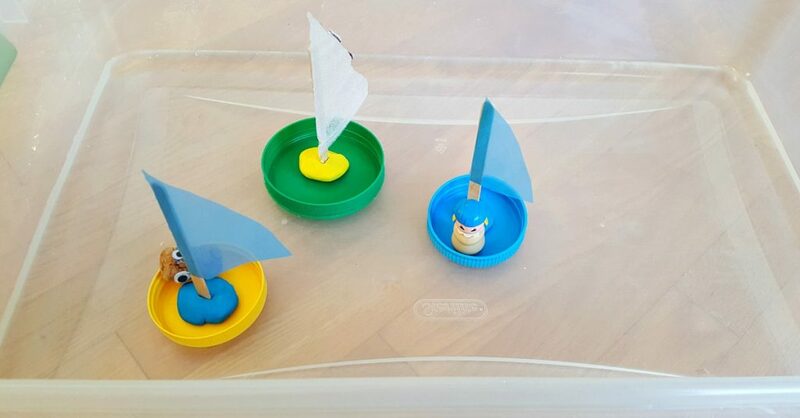 This Jar Lid boats water play is another simple and fun way to get your toddler to play. 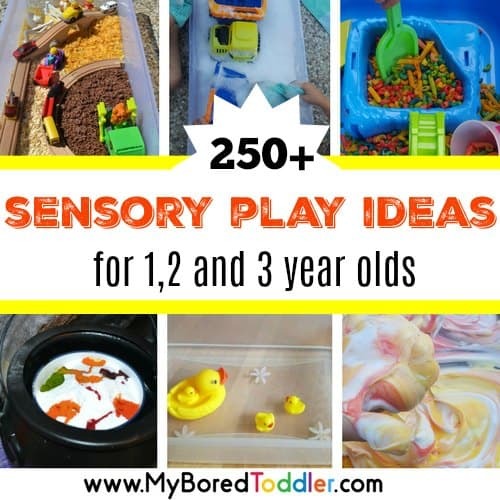 Our collection of water play activities for toddlers is one of our most popular posts and this another great way to play. 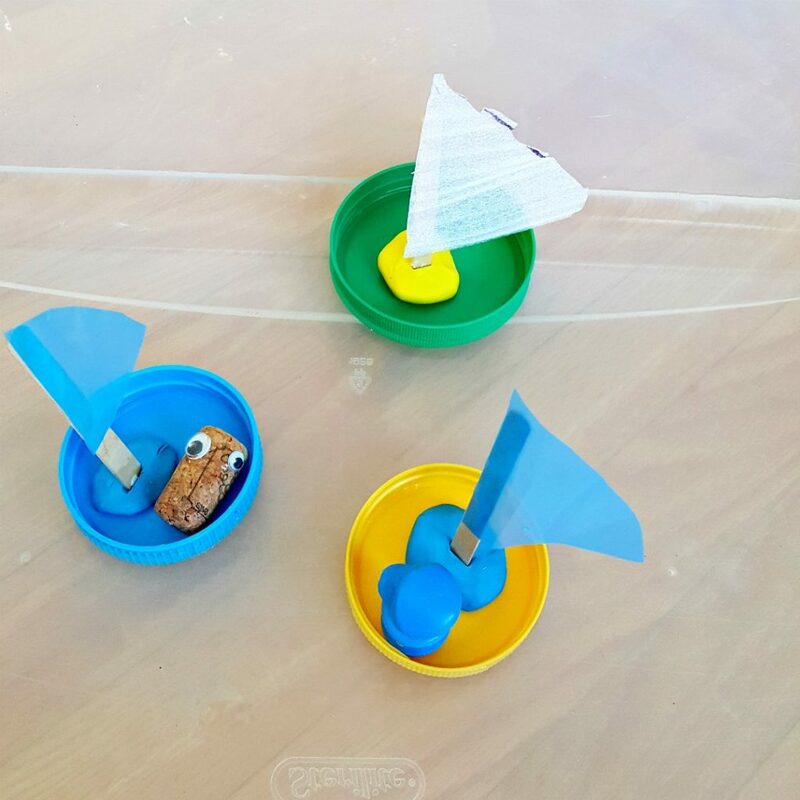 These little boats made from jar lids provide a fun way to explore colors, sink and float science, and sensory play. 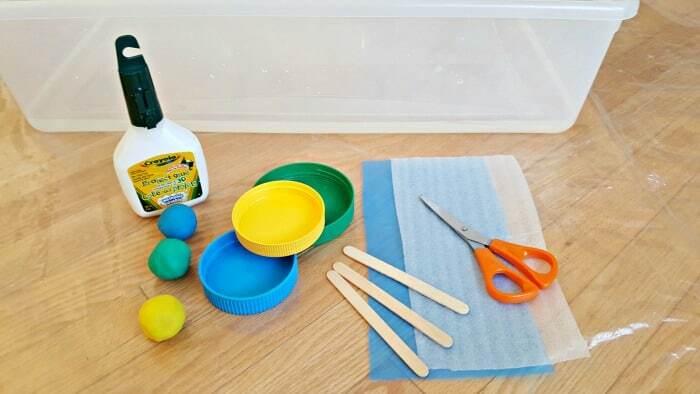 Recycle a few jar lids for this awesome water play activity your toddler will love! Activities that use recycled household items are always a hit, with both grownups and early learners. We all have access to cost-free materials that are easily accessible, and kids benefit from hands-on learning through play with familiar objects. It’s also great to encourage a reduce, reuse, recycle attitude as well. Water play is one area that is easy to set up with everyday items such as sponges, kitchen utensils and toys. In this activity, simple jar lids are salvaged from the recycle bin to promote sorting, matching, and hands-on discovery with early learners. 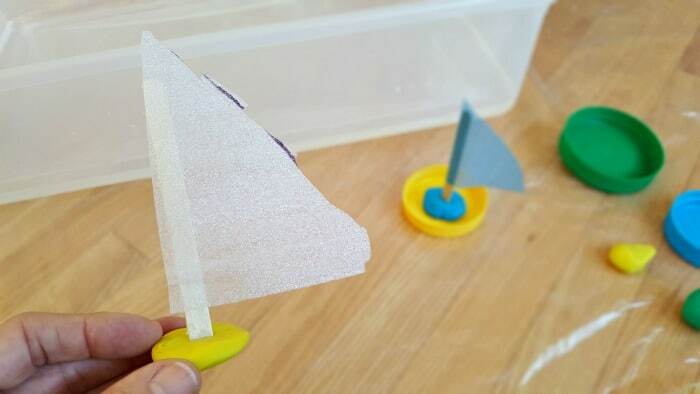 The plastic for the sail might be a little difficult for your child to cut, so you and your child can draw the sail together for you to cut out. Otherwise, engage your toddler in all the steps of making the boat and sail. Cut a sail from the plastic sheet. Glue the sail to a craft stick. Insert the stick into a small mound of clay. Place the clay in the boat and you’re ready to sail! Spread towels or a drop cloth on the table and/or floor. 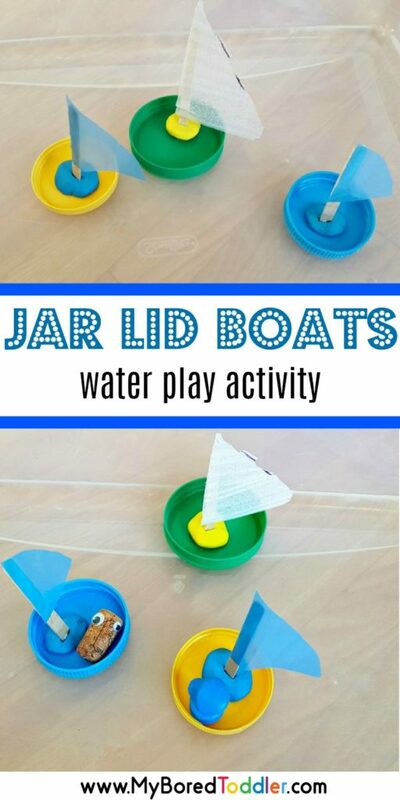 Fill a plastic bin with water and launch your jar lid boats. Do your boats sink or float? Add small figures to the boats for passengers. Do the boats still float? Are they tippy? Talk about what is happening to the boats as they bob on the water. Does your boat sink or float? Which boat is the biggest? Who wants to ride in the blue boat? You can add to the play with other toys such as ocean animals or plants. We love to add these ocean toys. Add a bit of color to the water with food coloring. 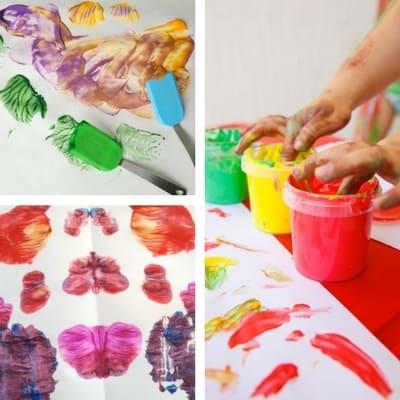 Kids will love the hands-on fun, experimenting and discovering, while enjoying some splashing around in the process! 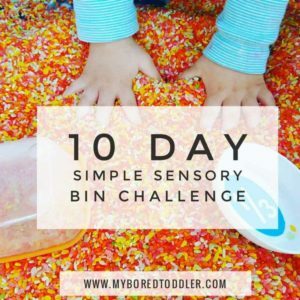 If you enjoyed this activity you will love our huge collection of baby and toddler water play activities – you might even like to take our FREE 10 Day Simple Sensory Bin Challenge. 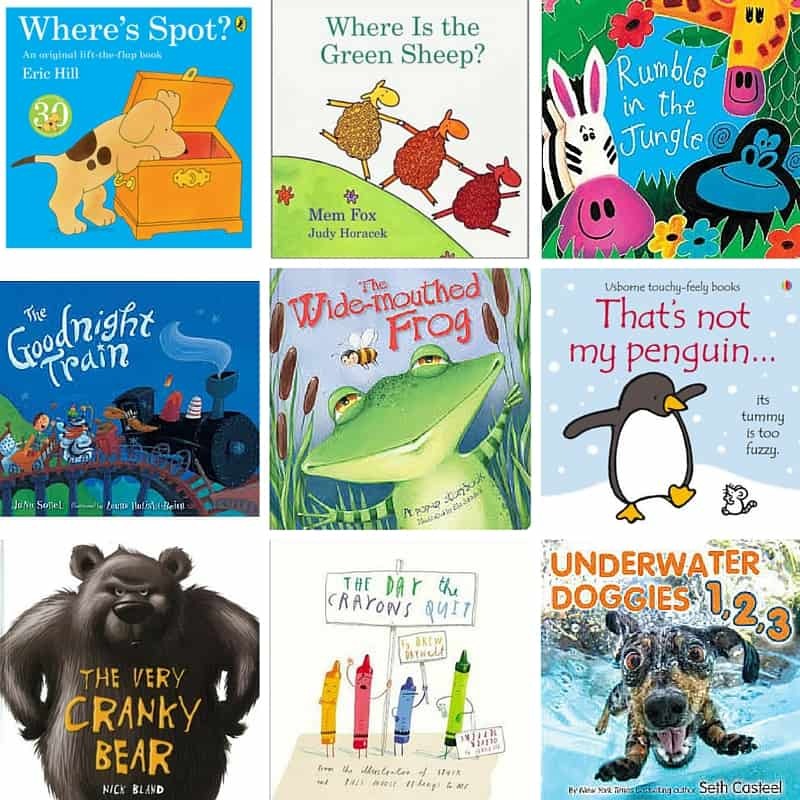 You can also join our Facebook group or follow us on Instagram for more fun toddler activities.